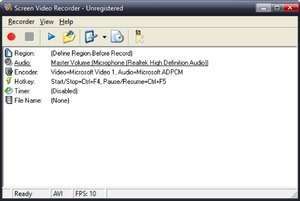 Screen Video Recorder records the contents of your screen; it can record just a region of the screen, follow the movements of your mouse or capture the entire screen and saves it in the format you want. It supports AVI, WMV, SWF or FLV video files. It is very easy to use, and allows you to pause the recording, resume and schedule it to start and end at specific time. Screen Video Recorder can be useful for creating simple presentations, creating tutorials or simply sharing the contents of your desktop with a friend. Screen Video Recorder 1.5.28 is a shareware program and can be used as a demo to try the software until the free trial period has ended. A full version of the program is available after the trial period ends. For security reasons, you should also check out the Screen Video Recorder download at LO4D.com which includes virus and malware tests. Additional screenshots of this application download may be available, too. Screen Video Recorder has a presence on social networks.